The revolt of 1857 has been seen essentially as a military rebellion, which was produced by the British follies of political ineptitude. Some scholars have interpreted the 1857 revolt as a Muslim conspiracy exploiting Hindu grievances. Politically, the revolt has been viewed as the last desperate effort of conservative India to protect its traditional institutions from the impending threat of modernity. I think that the revolt of 1857 marked a turning point in the history of India. It was the heralding of a new age. It crowned the dawn of India’s independence from the fetters of foreign rule that had bound her. It was, in fact, the first essay in India’s advent to freedom. It laid the foundation of Indian nationalism. It acted as a great inspiration to our countrymen, who felt inspired by the example set by the rebels who had died fighting the British despite the heavy odds against them. The revolt brought many changes in the British system of governance in the country. The immediate result of the revolt was the extinction of Mughal rule; and the end of the East India Company as the ruling power. The East India Company was replaced by the British Crown with Queen Victoria as the Empress of India. The Indian army was organised on communal lines; and the artillery came under the British control. The Bengal army that had been involved in the mutiny disappeared, and the army was unified under a single Commander-in-Chief. The revolt brought to an end the progress of social and material advancement, which Lord William Bentinck and Lord Dalhousie had initiated. The mutiny proved calamitous in the sense that it led to racial and religious chauvinism. The bitter memories of 1857 sowed the seeds of mutual distrust and resentment among the British and Indians, and estranged their relations. The age of Sir William Jones and Thomas Munro, the admirers of the antiquity of Indian culture, was over, and that of the aggressive Imperial-minded Curzon and Michael O’ Dwyer had come. The revolt exposed to Indians the oppressive and exploitative nature of British rule, and warned the British of the precariousness of their dominion. The British showered immense benefits on the princes and the landed gentry for their loyalty and support during the 1857 crisis. The princes began to play the British game, and acted as a bulwark against the rising tide of Indian nationalism. Enormous literature has appeared on the revolt of 1857. Sir John William Kaye and Col. J.B. Malleson published the first authoritative historical work entitled "History of the Sepoy War" in six volumes (1897). Kaye and Malleson were the historians of the empire, who attributed the British success over the rebels to the British character of muscularity. Kaye also emphasised that the economic factor played a crucial role in causing unrest among the peasantry in Oudh, which P.C. Joshi and Erick Stokes developed later in their studies. V.D. Savarkar, a firebrand revolutionary, published his book "The Indian War of Independence" in 1909 which the British authorities banned immediately. Savarkar glorified the heroism of Indian rebels, who had died fighting for the love of their country. Savarkar’s object in writing his book was to arouse a spirit of patriotism among the rising Indian youth. In his writings and speeches Jawaharlal Nehru maintained that the revolt of 1857 was a feudal outburst headed by feudal chiefs, and their followers and aided by others. He did not deny the popular character of the revolt, though he did not call it national, the expression which Karl Marx and the British conservative leader Benjamin Disraeli used. R.C. Majumdar, in his study "The Sepoy Mutiny and the Revolt of 1857" (1857) proclaimed with a rhetorical flourish that the revolt of 1857 was neither national, nor war nor of independence. Surrendra Nath Sen, a reputed historian, was commissioned by the Government of India to write a book on the 1857 revolt. His book entitled "Eighteen Fifty Seven" was released in 1957 to mark the centenary celebrations of the revolt. Sen came to the conclusion that originally the army revolted but later in Oudh, the revolt assumed some form of a national dimension in a restricted manner. Sen’s study provoked communist leader P.C. Joshi to publish his "Rebellion in 1857" (1957). Joshi’s study is an antidote to the orthodox Indian and British historiography. By using the Marxist methodology Joshi makes too much of the role the Indian peasantry played in the rebellion. In his foreword to Sen’s book, Maulana Abul Kalam Azad, the Education Minister, doubted whether there was any trace of a patriotic or nationalist sentiment among the Indian rebels. It would be clear from the foregoing account that there is a complete disagreement among historians and writers on the character of the revolt of 1857. The question boils down to whether the revolt was national, feudal or local or a combination of these elements in varying degrees. I think this historiographical confusion has risen due to the use of the Western concept of "national" and "nationalism" . If national revolt means, as it does in a looser sense, a rebellion of a subjected people against its foreign exploitative rulers, then the Indian revolt qualifies itself to be called a national one. But if a national revolt means the revolt of a politically organised community of a whole country sharing a common identity and fighting jointly against the ruling power, then the revolt of 1857 is not national. History is a serious business. It has no heroes or darlings. It is an explanatory mode of thinking. There are certain questions to be asked when we are celebrating the 150th anniversary of the revolt of 1857. We greatly admire the rebels, our forbears, who had fought with courage the greatest European power with meagre economic and military resources. But what were they fighting for, what was the cause dear to their heart? The sepoys had felt outraged when asked to use the greased cartridges containing the beef and pig fat. Did the feudal chiefs, Rani of Jhansi, Nana Sahib, Kunwar Singh and Tatya Tope think of the country or only of region, estate or locality? Were they motivated by personal interests or by moral ideals? Did they want to restore the Mughal sovereignty of Bahadur Shah as their emperor? Of course, the Maulavi of Faizabad, Ahmadulla Khan, was clear in his aims. Wearing a green turban he fought the British bravely and wanted to protect Islam from the onslaught of Christianity. 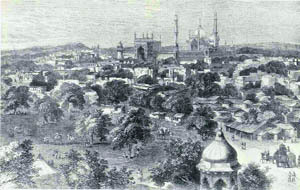 The poet Ghalib fretted and sulked, and called the Revolt of 1857 as rast khez-i-Beyja (unnecessary insurrection). S.N. Sen, P.C. Joshi, Majumdar and other writers have deplored the treacherous role of Bahadur Shah Zafar and the Mughal princes. The princes were prostituting at night, and in day time they were fleecing the Chandni Chowk Jain and Marwari moneylenders and accumulating wealth. It is true that Bahadur Shah was not a freedom fighter as made out by Mehdi Hasan and other writers. Bahadur Shah was a mock-king, a puppet in the hands of his wife, Mumtaz. He had no heart in the rebellion. He was dragged into it. He was a poet, a humanist, who abhorred violence. He was one of the finest representatives of Indo-Muslim culture, a true descendant of his ancestor, Akbar the Great, whose watchword was Suleh-e-Kul (Peace with all). 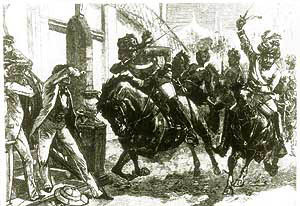 As I close this article, certain images of the past float, and the first is that of rebel sepoys fighting the British at Meerut on 10 May, 1857, and then rushing to Delhi. The next day the Indian troops face Bahadur Shah Zafar, and proclaim him the Emperor of India. The scene shifts to Indian House, London and the occasion is 50th anniversary of the revolt on 10 May 1907. The speaker is V.D. Savarkar who is exhorting the Indian youth to overthrow the British rule by revolutionary means, if necessary. On the centenary celebrations of the revolt, Jawaharlal Nehru, the Prime Minister of India, addressed a huge rally at Ram Leela ground, New Delhi on May 10, 1957. As a historian, Nehru drew lessons from the revolt experiences, and warned the nation to rise above the menace of caste, religion and region and dedicate themselves to making India a strong and vibrant nation. Nehru’s speech is one of the most moving and instructive documents. I should like the text of his remarkable speech to be translated in Indian languages and distributed among the youth in the college and universities of the country, as also among our members of Parliament, our rulers, who are expected to serve this nation with a sense of moral responsibility for the welfare of our countrymen.